The most common side effects are chills, flushing, rash, and nose bleeds. These are not all the possible side effects with RECOMBINATE. You can ask your healthcare provider for information that is written for healthcare professionals. Tell your doctor about any side effect that bothers you or that does not go away. Your body may form inhibitors to Factor VIII. An inhibitor is part of the body’s normal defense system. If you form inhibitors, it may stop RECOMBINATE from working properly. Call your healthcare provider right away if your bleeding does not stop after taking RECOMBINATE. Consult with your healthcare provider to make sure you are carefully monitored with blood tests for the development of inhibitors to Factor VIII. Please see RECOMBINATE Detailed Important Risk Information below. For additional safety information, click here for Prescribing Information and discuss with your HCP. Rx Only. For safe and proper use of this device, please refer to the instructions for use in the Prescribing Information. The BAXJECT II device should be used only with the intended product. The BAXJECT II device is intended for use with a single vial of product and is for single use only. Therefore, reconstitution and withdrawing a second vial into the syringe requires a second BAXJECT II device. Store vials in their original box and protect them from extreme exposure to light. Do not freeze. Where can I find information on CoPay Assistance for RECOMBINATE? For eligible commercially insured Shire patients, the Hematology Support Center’s CoPay Assistance Program covers out-of-pocket expenses*† related to a patient’s Shire Hematology treatment*† for which there is a co-pay, such as deductibles and coinsurances, up to the program maximum. Visit hematologysupport.com for more information, as well as full Terms and Conditions for Shire’s CoPay Assistance Program. *Certain restrictions apply. Not valid for prescriptions reimbursed, in whole or in part, by Medicaid, Medicare, Medigap, VA, DoD, TRICARE, or any other federal or state healthcare programs, including state pharmaceutical assistance programs, and where prohibited by the health insurance provider or by law. Offer good only in the United States. Offer void where prohibited by law, taxed, or restricted. Shire reserves the right to rescind, revoke, or amend this offer at any time without notice. Full terms and conditions apply to each program. †Nonmedication expenses, such as ancillary supplies or administration-related costs, are not eligible. Please check out our support programs that may be available for you. The Hematology Support Center (HSC) is a dedicated support team that helps to educate healthcare providers and patients, navigate insurance and access challenges, financial assistance options and education requests. 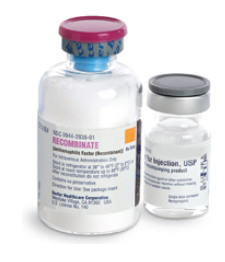 RECOMBINATE is a prescription medicine used to replace clotting factor (factor VIII or antihemophilic factor) that is missing in people with hemophilia A (also called “classic” hemophilia). Who should not use RECOMBINATE? RECOMBINATE is used to prevent and control bleeding in people with hemophilia A. Your healthcare provider (HCP) may give you RECOMBINATE when you have surgery. RECOMBINATE is not used to treat von Willebrand disease. Are allergic to mouse, hamster, or bovine proteins. Tell your HCP if you are pregnant or breastfeeding because RECOMBINATE may not be right for you. What should I tell my HCP before using RECOMBINATE? Have any allergies, including allergies to mouse, hamster, or bovine proteins. Are breastfeeding. It is not known if RECOMBINATE passes into your milk and if it can harm your baby. Are or become pregnant. It is not known if RECOMBINATE may harm your unborn baby. Have been told that you have inhibitors to factor VIII (because RECOMBINATE may not work for you). What important information do I need to know about RECOMBINATE? You could have an allergic reaction to RECOMBINATE. Symptoms of an allergic reaction may include rash or hives, itching, tightness of the throat, chest pain or tightness, difficulty breathing, lightheadedness, dizziness, or fainting. If you experience any of these symptoms, stop using RECOMBINATE and call your HCP right away. What else should I know about RECOMBINATE and Hemophilia A? Your body may form inhibitors to factor VIII. An inhibitor is part of the body’s normal defense system. If you form inhibitors, it may stop RECOMBINATE from working properly. Talk with your HCP to make sure you are carefully monitored with blood tests for the development of inhibitors to factor VIII. What are possible side effects of RECOMBINATE? The most common side effects reported during clinical studies with RECOMBINATE include: chills, flushing, rash, and nose bleeds. Tell your HCP about any side effects that bother you or do not go away or if your bleeding does not stop after taking RECOMBINATE.